even God can’t help you! 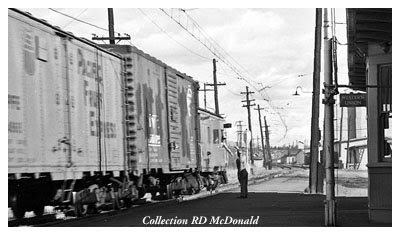 Milwaukee Road, Ellensburg Washington, March 18, 1961. Here is a rudimentary form of “Positive Train Control” in action, as the operator in Ellensburg hands up a train order set to the conductor. In those days, trains ran under the iron-fisted direction of the Division Dispatcher, regulated clock, pocket watch, employee timetable and the flimsy train order. You may recall the disastrous collision between a Metrolink passenger train and a Union Pacific freight train in September 2008 resulting in the deaths of 25 and injuries to more than 130. Following that disaster, Congress decreed that by 2015, US railroads must have some system of Positive Train Control (PTC) in place. Simply stated, the goal of PTC is to insure no two trains attempt to occupy the same spot on planet earth at the same time! Railroaders recognized the need for PTC from way back when. Various systems of this and that, including carrying tokens from one control point to the next. But the combination of timetable, regulated clock, pocket watch, train register, and the Authority of the Dispatcher, proved to be useful for many years. Issuing of train orders, and coordination between the engineer on the head end and the conductor in the caboose worked well at origination terminals. But what about modifications to operating authority resulting from an endless variety of circumstances? How were changes in operating authority transmitted to a fast moving train, without the time consuming stop and restart? Twice. Once for the head end; second for the crew car. Enter the train order hoop. Staring down the track at hundreds of tons of steel hurtling toward the operator had to be a humbling experience. Operators worked out various methods to figure out where to stand so they would still be standing in the same spot after the cacophony of slam-banging steel rods and wheels had thundered by! And whilst mating with the head end was harrowing enough, standing by bang-crashing lurching railcars waiting for the crew car to arrive was equally humbling. There was always the possibility of dunnage hanging out of car doors, which could severely injure the agent. From the viewpoint of the train crew, leaning out the doorway, hoping the operator had strung the hoop with twine - not piano wire - had to be thrilling as well! And that was in daytime, with nice weather. How about on a dark stormy night in a downpour or blizzard? 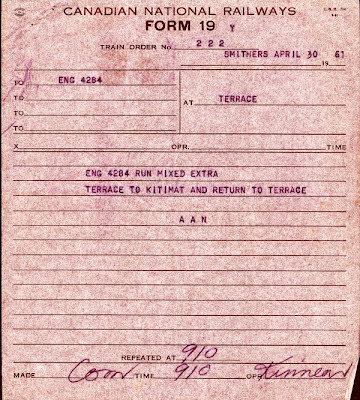 One early method of sending paperwork up to the crew involved the Flying Hoop. 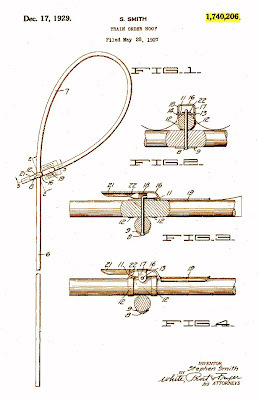 This drawing is from a 1927 patent application. The concept was simple enough. Secure the modified train order set to a rattan hoop, and hold it up for the passing train crew to snag with an arm. Once the order is received, the empty hoop is tossed out of the cab. For the operator to retrieve. The process repeated by the tail end car! Hoop retrieval had to be a fun experience. From the Patent Application: It is the custom in transferring orders from the ground to a passing train to clip a piece of paper bearing the orders to a. suitable holder which is held to be easily grasped by a trainman as the train passes by. The paper containing the orders is detached from the holder, which is then tossed from the moving train to be retrieved later. Such hard usage renders the life of ordinary holders short. It is usual to provide a clip on the holder for frictionally retaining the order of up to 25 sheets. In wet weather the paper becomes damp and tears easily and the trainman must use great care in removing it from the clip. This is particularly the case when the engineer who usually is further handicapped by wearing gloves. It is therefore an object of my invention to provide a train order holder which is sturdy and which will stand considerable rough usage. Another object of my invention is to provide a train order holder from which the train orders can readily be detached. An additional object of my invention is to provide a train order holder, which can easily be operated by trainmen wearing gloves. 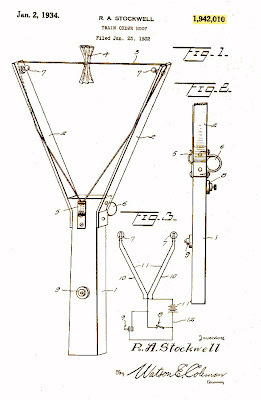 The “Flying Hoop” concept was improved upon shortly thereafter in this 1934 patent application. High technology was applied in the form of two battery-operated lamps, (#7) illuminating the paperwork a night, suspended in a triangle of twine. If all went as planned, the hoop stayed with the operator. From the Patent Application: The primary object of the present invention is to provide a train order hoop having associated therewith means whereby the order carried thereby may be illuminated so that the picking up of the order at night by a trainman will be greatly facilitated. One can only wonder just how visible those hoop-mounted lamps were! I recently read an account of a head end brakeman leaning out the gangway on a locomotive thundering down the track, in the middle of the night, in a drenching downpour. The hapless crewman missed the hoop, missing the train orders, forcing an unscheduled stop. It was said that the roaring outburst of profanity from the hogger could be heard clearly above the din of the storm! And the young brakeman briefly thought of walking right into the next state, as he went back to retrieve his quarry. 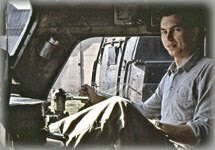 I was home on leave from the US Air Force, and my buddy El Purington and I had just finished pursuing an east bound Northern Pacific freighter up from the Green-Duwamish River watershed from Auburn to Covington. As darkness fell, we continued about 10 miles up State 18 to the Pacific Coast Railroad – Milwaukee Road – at Maple Valley. By the time we got there, it was windy and pouring rain. And the operator had a set of orders to send up to the westbound Milwaukee box cab E-32A. Fortunately, Maple Valley was “up to date” with a state of the art twin frame train order stand. The upper hoop was loaded with orders for the head end and the bottom hoop was loaded for the crew car. The operator was out of harms way, safely warm and toasty inside the station, and had only to watch the well-lit frame to make sure the crew got their paperwork! Just missed the fireman picking up the top set of orders for the cab. Bottom set awaits the caboose. Sending stuff up to moving trains does not always involve train orders. Here we see a set of switch keys being sent up to the approaching engineer! Finally, as technology ushers in an entirely new concept in Positive Train Control using GPS and sophisticated electronics, can we be far behind the prediction that no humans will be aboard locomotives of the future? Maple Valley Train Order Frame: Hand held. Ektachrome ASA 160, 1/8th sec at f1.9 Minolta ST101. It could cost a fortune implementing electronics, or cost a fortune placing unemployed people as operators again. 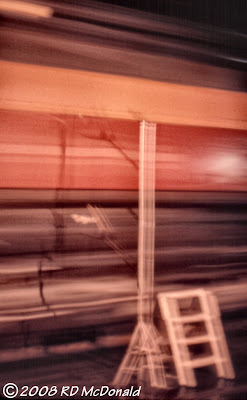 Great post as usual, nice catch of the boxcabs blurred at night - I love it!